Type E/F - The Round Pin plug socket standard is used in over 50 countries around the world. 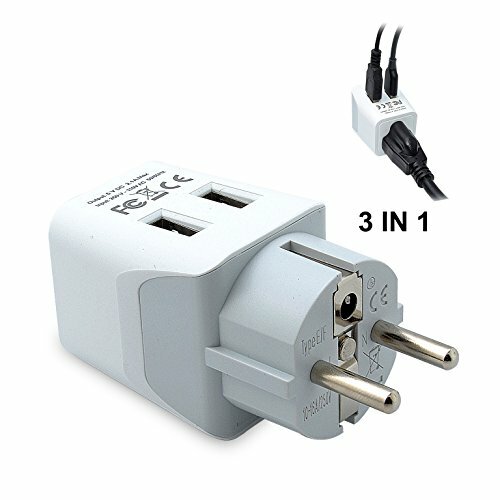 The Ceptics Type E/F Schuko best adaptor for wall offers a reliable and easy connection for devices with a North American plug or polarized (one blade is wider than the other). The ultra compact size of this adapter makes it an ideal adapter for your travel needs. Works in France, Germany, Greece, Hungary, Iceland, Latvia, Lithuania, Luxembourg, Macedonia, Montenegro, the Netherlands, Norway, Poland, Portugal, Romania, Serbia, Spain, Slovakia, Slovenia, Sweden, Switzerland, Turkey , Ukraine, Albania, Austria, Belgium, Bosnia-Herzegovina, Bulgaria, Croatia, Cyprus, the Czech Republic , Denmark, Estonia, Finland. Please make sure that your Device supports 100-240V when traveling overseas in order to use with this adapter.